Markets are complex social systems. We acknowledge that and work with you to navigate through Structures, Rules and Flows of the market while understanding underlying biases and discerning patterns. By understanding the structure and patterns in the market – we develop systematic change actions so that the biases and drivers that direct the way the market system becomes inclusive. Our approach influences market actors by correctly aligning incentives so that the system self-organizes. We understand the move to a systematic change includes adaptive and technical fixes – requiring to work in micro, meso and macro levels. 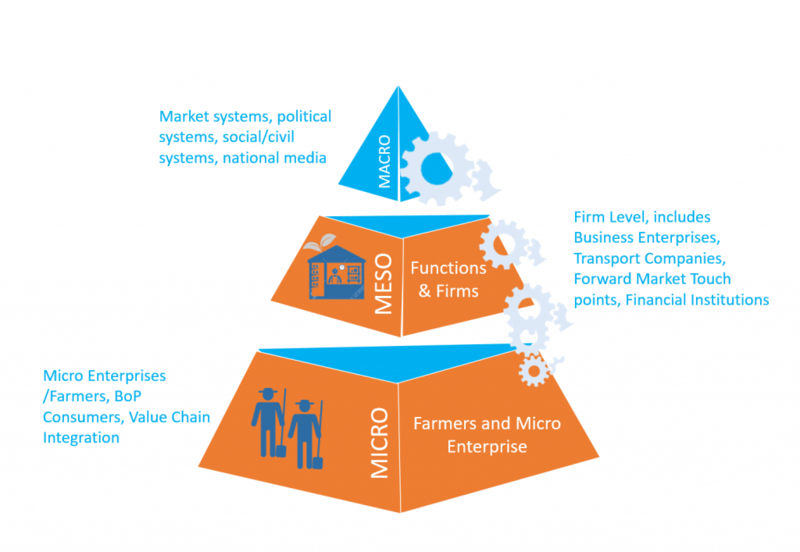 As such if we are looking at the agro-sector for example we just don’t work with farmers but work with other players in the value chain including actors like traders, financial institutions, transport companies, forward linkage firms, supermarkets as well as policy advocacy via national media and the government.